Lorraine Cecil is the winner of the Hospice Caregiver Award presented by Horan & McConaty. She was nominated by Shannon Kilrow from Hospice Care of the Rockies. 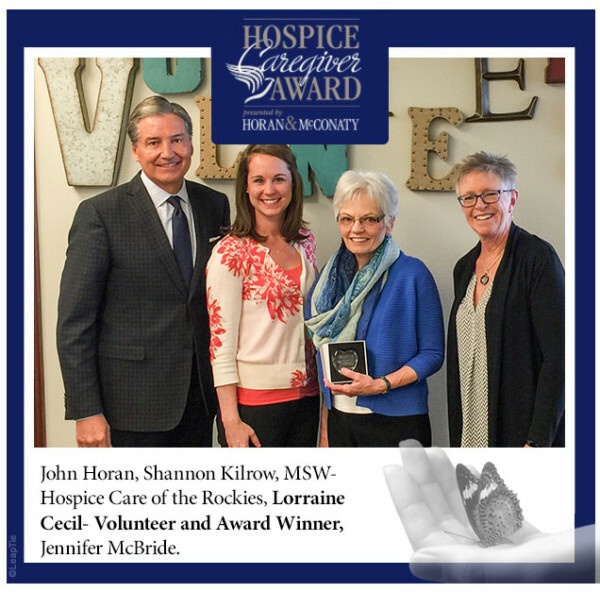 Lorraine Cecil has been a volunteer with Hospice Care of the Rockies since 2014. Lorraine demonstrates considerable and consistent commitment in terms of time, amount of responsibility and longevity. Lorraine has made an incredible impact on our hospice patients over the years, always willing to take on the more ‘difficult’ patients. Lorraine has a calming and peaceful presence and is able to easily share space and provide comforting presence to our patients, while also has the personality and willingness to engage with patients in conversation and life review. Lorraine goes above and beyond as a hospice volunteer. For example – Lorraine visited with a hospice patient in her home who was primarily bed bound and had not left her home in many years. Lorraine recognized boredom and need for stimulation for this particular patient and therefore took it upon herself to check out library books for the patient regularly, which they discuss during their visits. Lorraine is also very crafty in knitting and sewing and shares these gifts selflessly with our patients. Whenever I have a volunteer request Lorraine is one of the first volunteers I turn to, as she is prompt, responsive, and always willing to go the extra mile for our patients. Lorraine has taken on multiple patients at a time with the intention to “ease stress, pain and fear of death”. Lorraine does this in a spectacular manner. Lorraine does not limit herself to direct patient care, she is also an excellent asset to events held by Hospice Care of the Rockies. Lorraine jumped at the opportunity to help with a Vow Renewal Ceremony at a local nursing home. Lorraine shared her skill of photography and photographed the many elderly couples who came to renew their vows on Valentines Day. in addition to this, she had no problem (in fact, was extremely helpful) in setting up and then cleaning up the event. Lorraine helped the event to run smoothly – and added a special element, taking photos for the couples. Lorraine provides immense amounts of her own time to our patients, in 2015 and 2016 Lorraine provided the most volunteer hours to our volunteer program throughout both years. She is consistent about her visits and recognizes the importance of commitment to our patients. I cannot think of anyone more suited to receive extra special recognition for her unwavering commitment to hospice patients and their families.